BitStarz Casino is welcoming all new players to its casino with a 20 free spins no deposit bonus on a multitude of exciting video slots! 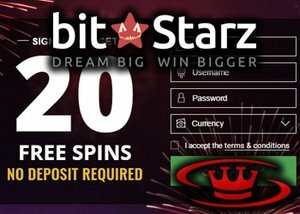 When you register and join BitStarz, you can enjoy the 20 free spins no deposit bonus on a wide range of games powered by leading software developers such as Microgaming and NetEnt. This includes video slots from NetEnt such as , Lucky Angler, The Wish Master and Champion of the Track or slots such as The Dark Knight Rises, Castle Builder or Tomb Raider 2 and. Your free spins will be credited within 24 hours upon registration but the fun does not end there. Joining the free spin offer is several deposit bonuses on your first four deposits along with multiple weekly promotions to help your bankroll turn into big winnings. After enjoying the free spins, making your first bitcoin deposit will see a 100% bonus up to $100 or one bitcoin. This bonus will include 180 free spins on Fruit Zen, Starburst or Boomanji. As with the initial spins awarded, these will be applied to your account within 24 hours of your deposit at a rate of 20 spins for the next nine days. When ready to make another deposit, BitStarz will add a 50% bonus up to €100 or one BTC to your deposit. On your third deposit, a bonus of 50% will be added up to $200 or two bitcoin and a further bonus of 100% up to $100 or one bitcoin will join your fourth deposit. To keep the action front and centre, BitStarz offers a range of weekly promotions. This gets underway with Rook's Double Cash, any time you get five red masks in a row horizontally, the casino will double your win! Slot Wars will see a new promotion each and every month that will reward the top 30 bitcoin wagers and the top 20 European wagers with a share in 5 bitcoins and €500. The best part - no need to opt in or register for this promotion, playing gets you automatic entry! Each Monday you are entitled to a 50% reload bonus up to $50 or 250 mBTC. To qualify for this weekly bonus, simply deposit and your bonus automatically will be applied to your account bonus. Every Wednesday is a day of giving, giving free spins that is! Simply make a deposit before midnight and you will receive free spins by noon the following day. This requires a minimum deposit of $30 or 30mBTC to receive 20 free spins. Deposit $150 or 150 mBTC and receive 80 free spins! Register at BitStarz Casino today and experience the excitement of free spins, generous deposit bonuses and some of the nets best casino games.